At top is a #14 crochet hook. It is by far the fastest and easiest method. The downsides are that you can only load about 5 beads at a time and the #14 won’t accommodate anything smaller than a #6 bead. For lace weight yarn I usually use a #8. In the middle is the super floss. This is the securest method, offering the least chance of having beads roll all over the floor. It also holds the most beads. It’s a little slower and more fiddly than the crochet hook, and because it’s floppy, it’s hard to carry next to my knitting needle with my right hand. I end up dropping and picking it up a lot, which slows me down. At the bottom is the new Fleegle Beader that I just got from the Gossamer Web. I was really excited about this as the perfect solution. I sat down to use it, and after about a hour was ready to chuck it across the room, to join all the beads that were already there after falling off! 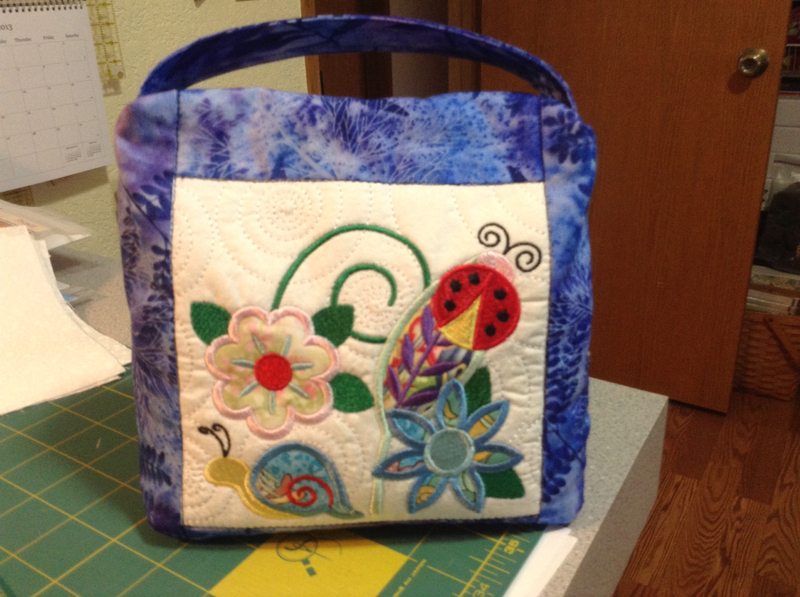 I tucked it away in its little tube and proceeded on with Evenstar’s border using the floss method. This morning when I sat down to knit, I decided to give it another try, and doggone if it didn’t work! There is definitely a learning curve and you have to get used to putting tension on the yarn and then pushing the bead up and over rather than pulling the yarn through, which is what you do with the other methods. So this just may work. I’ll keep you posted. 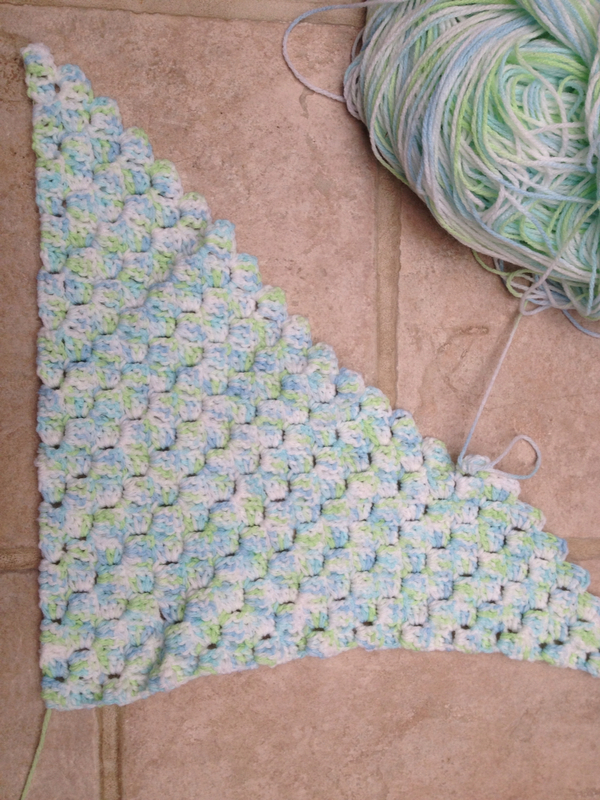 So far, 5 repeats of the border done – 51 to go! With all this lovely beading going on, I had to force myself to work on Dark and Stormy, but I did and finished the knitting. I’m not at all happy with it. As you can see on the right side of the picture, the shoulder area bunches up terribly! 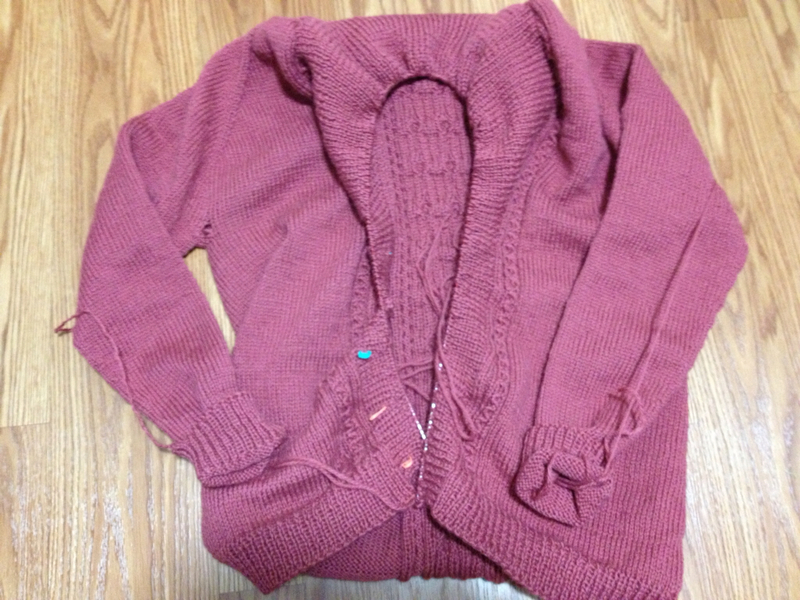 I’ve looked at other finished sweaters and I see that in some of them too. I wouldn’t be adverse to ripping out the collar and trying again if I knew how to fix it. This one may have to simmer a bit before I figure out what to do. 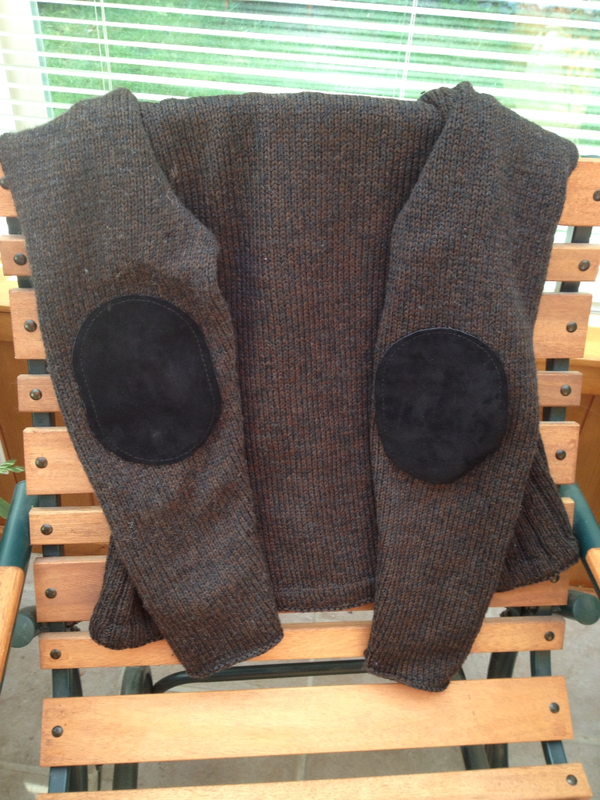 In the continuing saga of Ben’s sweater, he kept ripping out the elbow, so I finally relented and sewed on elbow patches. I guess the upside of this is that he loves this sweater and wears it constantly. That makes it all worth it! I can’t believe that Isobel will turn 8 this week! Where has the time gone? 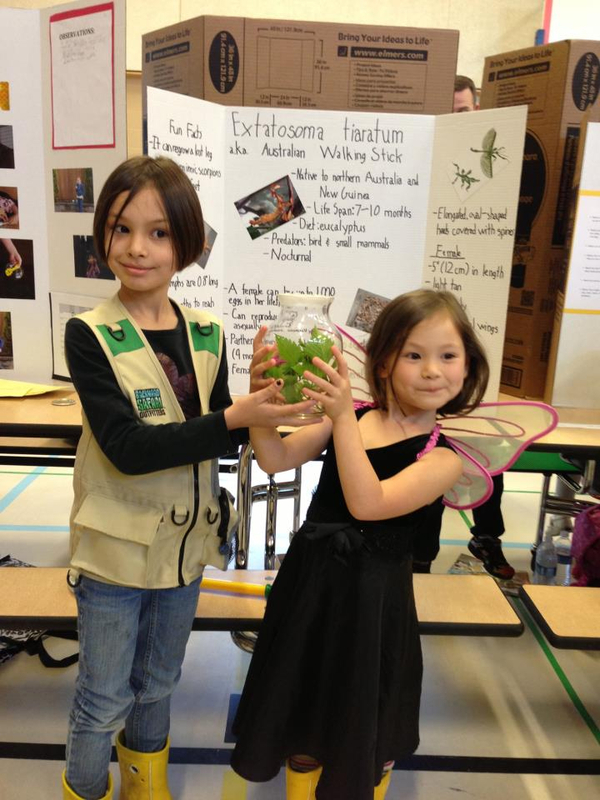 She did her science fair project on the Australian Walking Stick. Hers is named Popcorn. Doesn’t she look grown up? Many years ago, just after I got married, I was into crochet in a big way. One year everyone got intricate doilies for Christmas. Strangely enough I didn’t keep many for myself, so few remain. 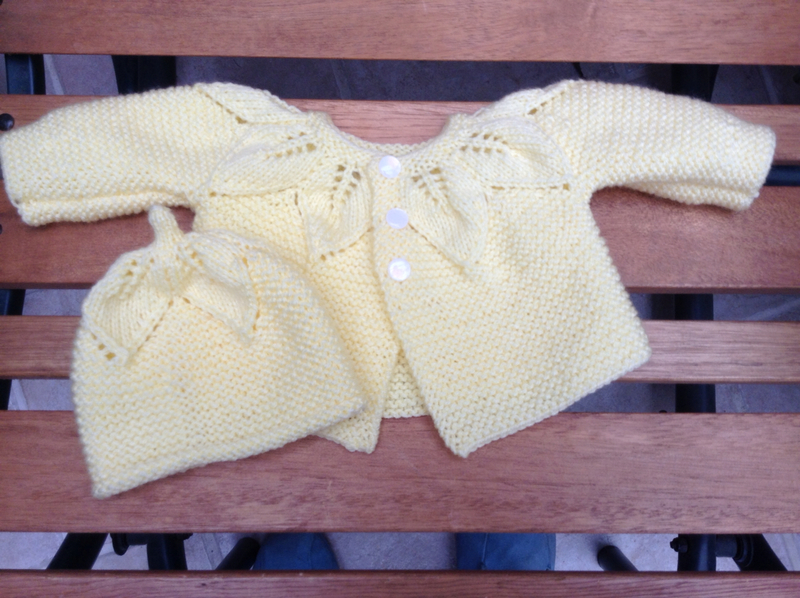 Recently I was reading my favorite blogs and came across a cute little baby blanket crocheted by Vera. She kindly responded to my inquiries about it, I did some stash diving, rustled up the correct size hook and went to town. I’m finding the crochet a nice change of pace. I don’t think I’ll be jumping ship from knitting anytime soon, but may do more than one of these little blankets for our hospital project. They do go fast! 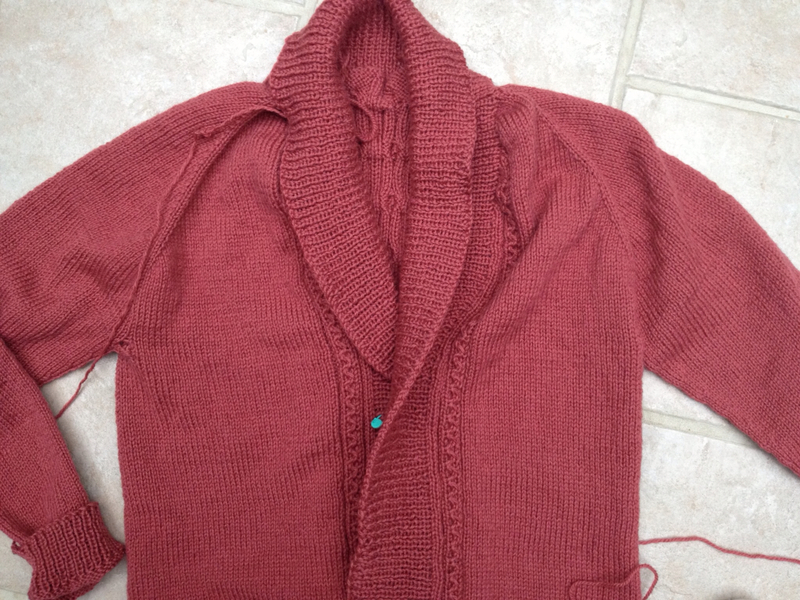 I’ve been working away on Dark and Stormy and am into the long slog of the shawl collar. I only have an inch and a half to go, but it’s so heavy that it’s not much fun to work with. I’m getting a little nervous about the fit. The sleeves are too long, but that’s easily fixed since it’s knitted top down. But the shoulder area seems a little “wonky”. In looking at other finished projects some of them seem that way too, so I guess it remains to be seen if that will block out, and if not, can I live with it? 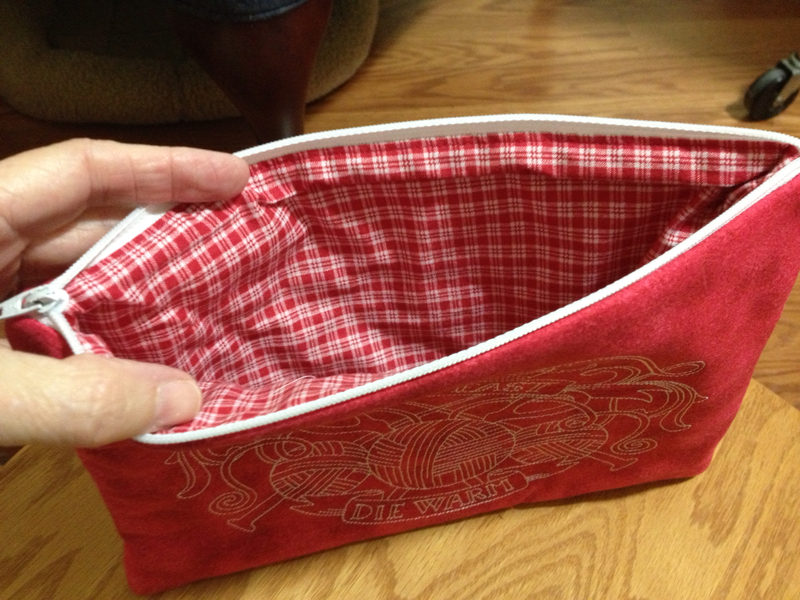 Can’t seem to figure out how to rotate the picture in Blogsy – I’ll work on that! 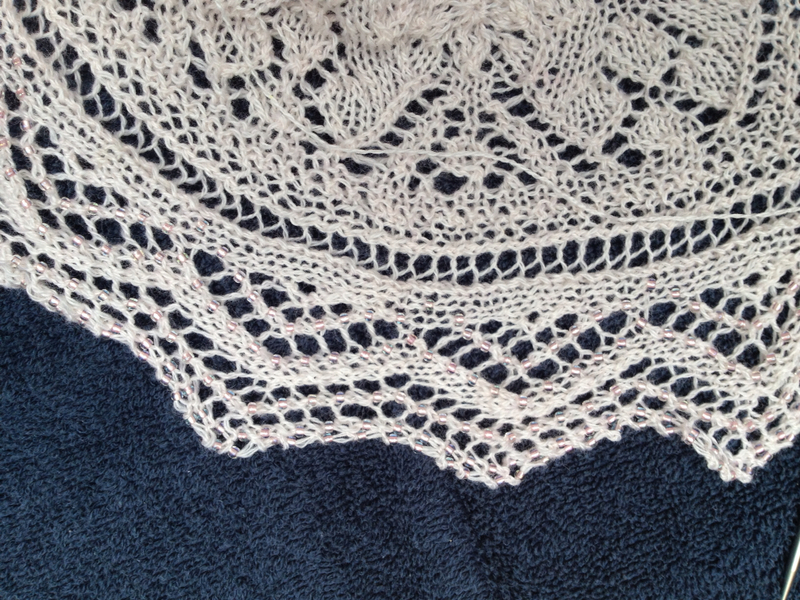 I’m planning a big lace project for my summer knitting. As soon as I saw Fire Dance I knew I had to do it. I preordered the kit in a gradience with beads. Yeah, call me crazy. First, though, I have to finish Evenstar. The body is finished and I have made three aborted attempts to start the border. I made the mistake of trying to work on it when I was tired. Late at night with size 11 seed beads is not a good combination! Perhaps it’s just as well that I had to frog back because I’ve come to the conclusion that I don’t have enough beads. I can’t remember where I got these, so can’t get more. So I ordered enough size 8’s, which is what the pattern calls for. I also ordered a beader from the Gossamer Web. 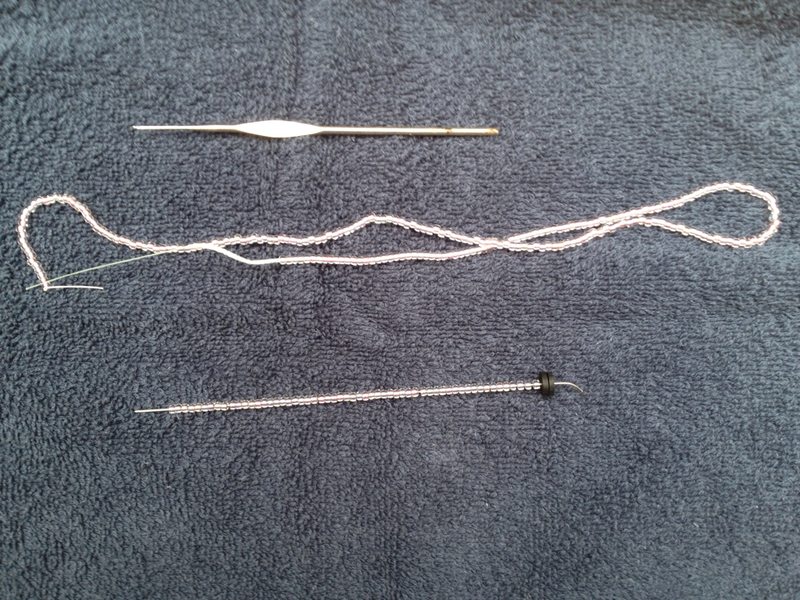 Every time I turned around I was dropping beads off my crochet hook, so I think this will be less frustrating. I’ll give a full report when It gets here. In other news, I’m going to be reopening my Etsy shop. I see a market for iPad and Kindle cases and have found a design that is versatile and open to so many ideas for decoration. Here are a few of my prototypes. 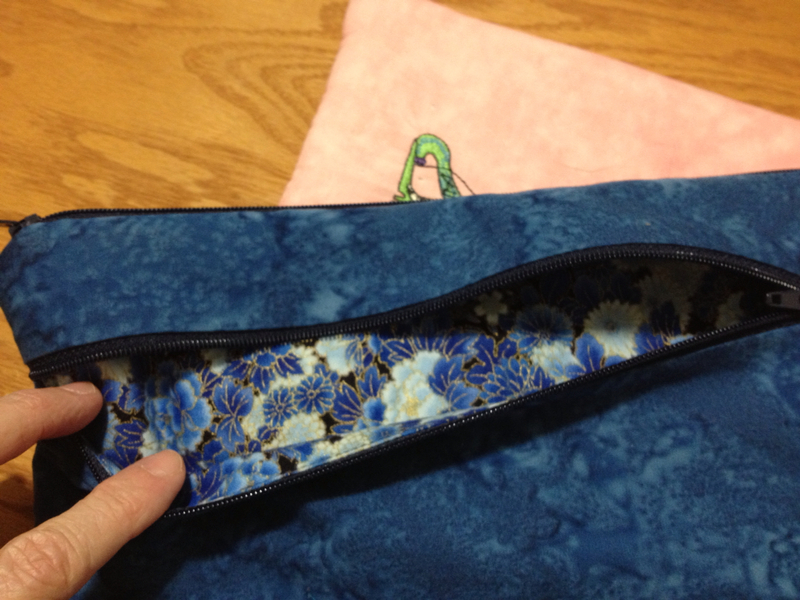 They are fully lined with no raw edges and have an outside zippered pocket. They will fit an iPad mini (with Smart Cover), a Kindle Fire and of course, any of the smaller Kindles or other ereaders. 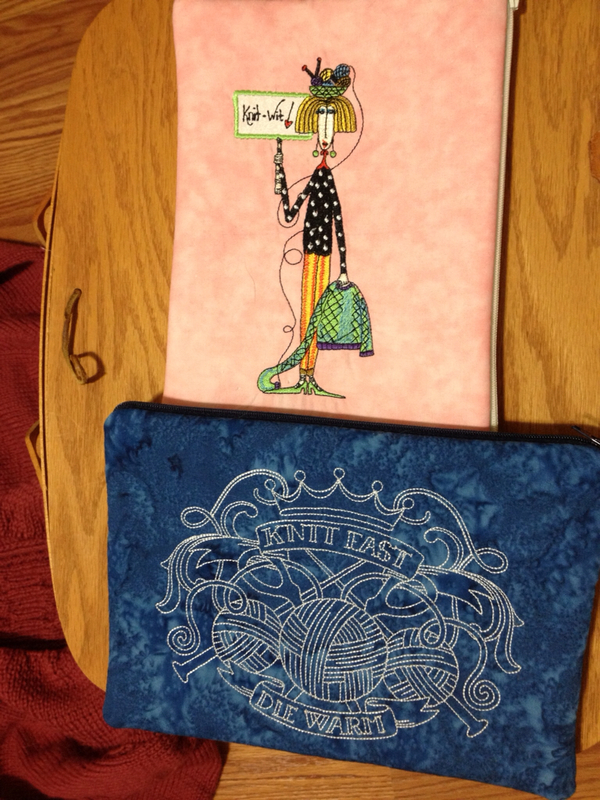 They do not fit the larger iPads, but if these go over well and there is an interest, I may offer those as well. And they can certainly be used for other things as well. Stay tuned! Well, I did it! It wasn’t pretty, but I did it. There were several things I was worried about. First was the weather – I was afraid it would rain. And it did! In fact, I heard that the marathoners, who started earlier and joined in with us about halfway, ran into hail. Thankfully we only hit rain, but it really didn’t seem to affect me much, which surprised me. The second thing that worried me was my knee. It held up just fine. I ended up doing a combination of light running, walking, power walking and about everything in between. I was worried about finishing last and I didn’t!! I was especially proud of Abby, who ran a 2:17 which put her about midway in the rankings. Not bad for a beginning runner. My time was “ahem” a little longer, but the fact is, I finished! A nice perk was that as I came across the finish line, they called my name over the loudspeaker and a city councilman, who just happened to be my brother-in-law, was there to present me with my medal. 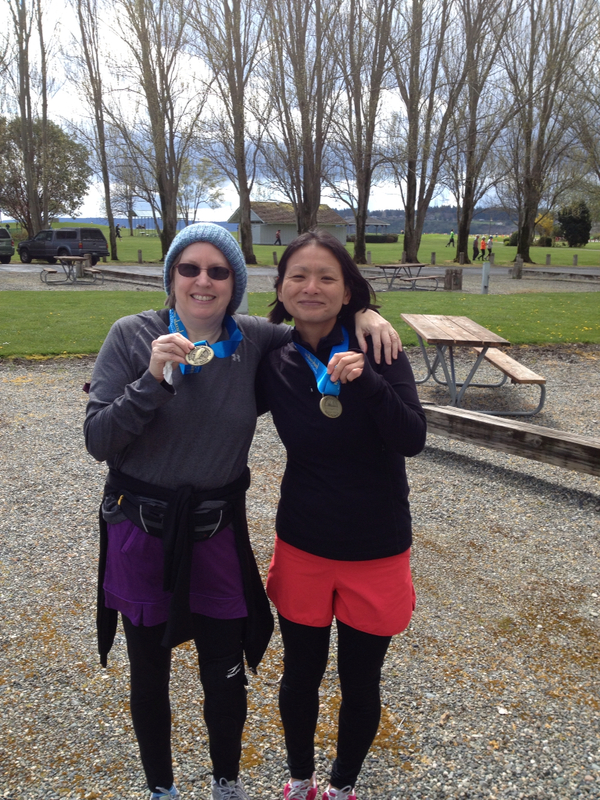 I don’t think we looked too worse for wear, but we were soaked! Will I do it again? Maybe, but it’s kind of like childbirth. I have to forget this one first. Today I took it really easy, dosed myself with Ibuprofen and have spent most of the day watching BBC mysteries and knitting. I’m engaging in a different kind of marathon and trying to get Dark and Stormy done. 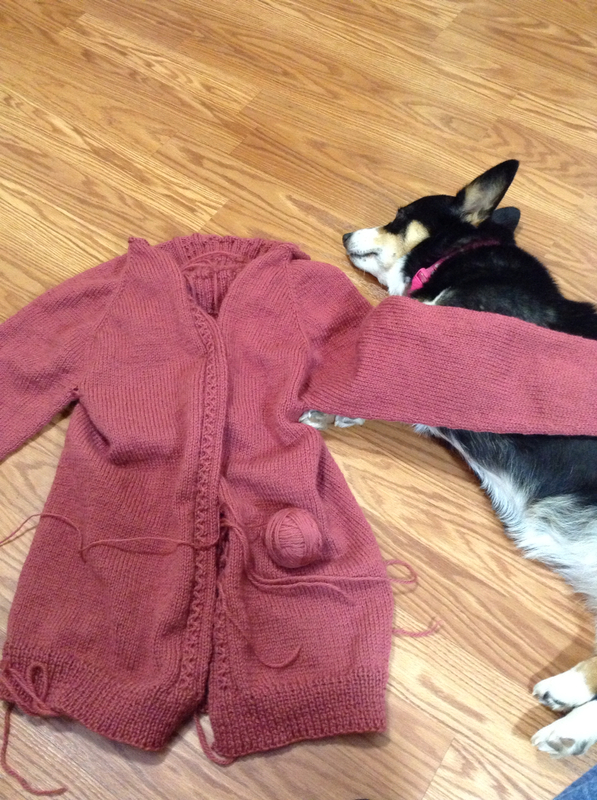 I am agreeing with Lorette that I’m not too keen anymore on seamless sweaters. As much as I dislike seaming, I think I’m disliking even more having this huge bulk of sweater in my lap to turn as I do the sleeves. But I am getting near the finish line! Maggie approves. I’ve just been listening to the news and my heart breaks about the news from Boston. Yesterday some of the marathoners running alongside us were running to qualify for the Boston marathon next year. Such evil in the world! This is a great little pattern from Leisure Arts. You can see the particulars on my project page. I made this little set in just two days. There was some car knitting involved, but still it was quick and easy. I did make some modifications to the hat. The notes are on the project page. One blanket is finished, but needs to be blocked before a photo and another is in the works. In other news, there has been a change of plans regarding the half marathon. Several weeks ago during my 10 mile run, my left knee seized up on me at mile 7.5. I thought I would just walk the last few miles, but by 8.5 miles, I was really hurting. Hubby picked that opportune moment to call me and I had him come pick me up. Since then I've been icing, stretching, foam rolling and strengthening. It has gotten a lot better, but it still hurts to run. The good news is that I can walk – and I can walk fast. I've done one 8 mile walk that came very, very close to the time it took me to run it. So instead of running the half, I will be walking it. After all, 13.1 miles is 13.1 miles, right? The other good thing is that this will be sustainable and I think I've even talked hubby into joining me – not on the half, but on future, shorter walks. Not much else to report, so I'll leave you with pictures of the girls. 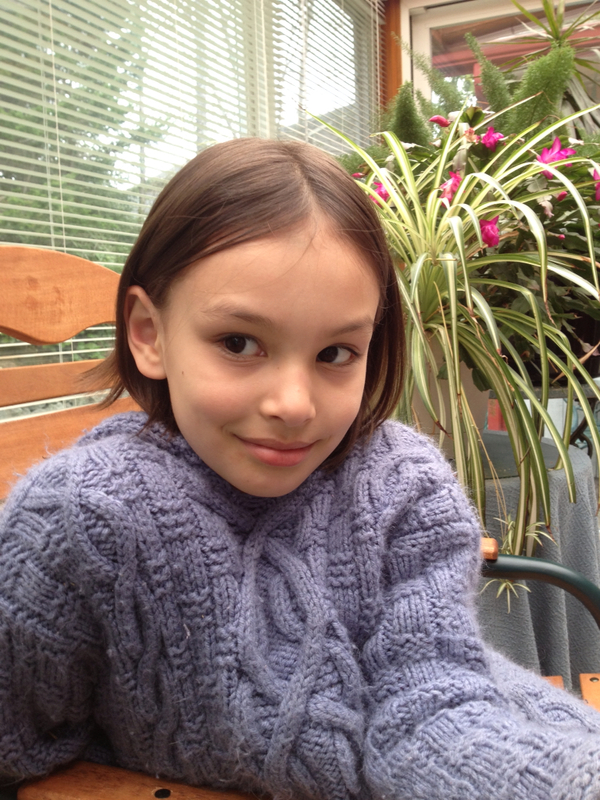 I can't believe Isobel will be 8 in a few weeks. 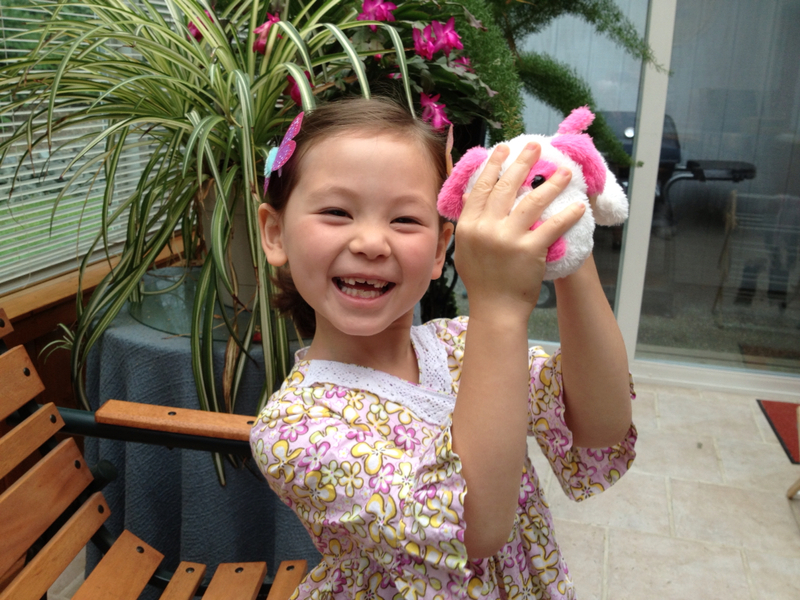 And don't you just love Mei-Mei's gap toothed smile?